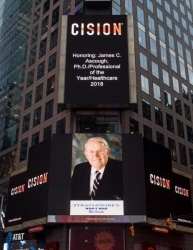 West Lafayette, IN, January 15, 2019 --(PR.com)-- James C. Ascough, Ph.D. of West Lafayette, Indiana has been honored as a Top Executive for 2018 and recognized on the famous Reuters Billboard in Times Square in New York City by Strathmore’s Who’s Who Worldwide for his outstanding achievements and high level of success for over 57 years in the field of healthcare. About James C. Ascough, PH.D.
James C. Ascough, PhD is in part-time private practice in West Lafayette, Indiana. Semi-retired, he continues to provide assessments and counsels children and adults. Born on August 20, 1936 in West Virginia, James obtained a Ph.D. from the University of Georgia in 1967. He served on the faculties of the University of Georgia and Purdue University, and was Director of Child and Adolescent Services at Wabash Valley Hospital in West Lafayette, Indiana. Dr. Ascough has published 3 books. One he wrote with Ronald E. Smith in 2016 titled, “Promoting Emotional Resilience: Cognitive-Affective Stress Management Training” and is available on www.amazon.com and www.guilford.com. He has also written many research journal articles. His research focused on autonomic nervous system arousal, measures of affect, and models of cognitive imagery and behavior change. James is a recipient of the Sagamore of the Wabash Award, Indiana’s highest state honor, for his contributions to youth mental health. He is affiliated with the I.P.A. In his spare time he enjoys sailing and photography.